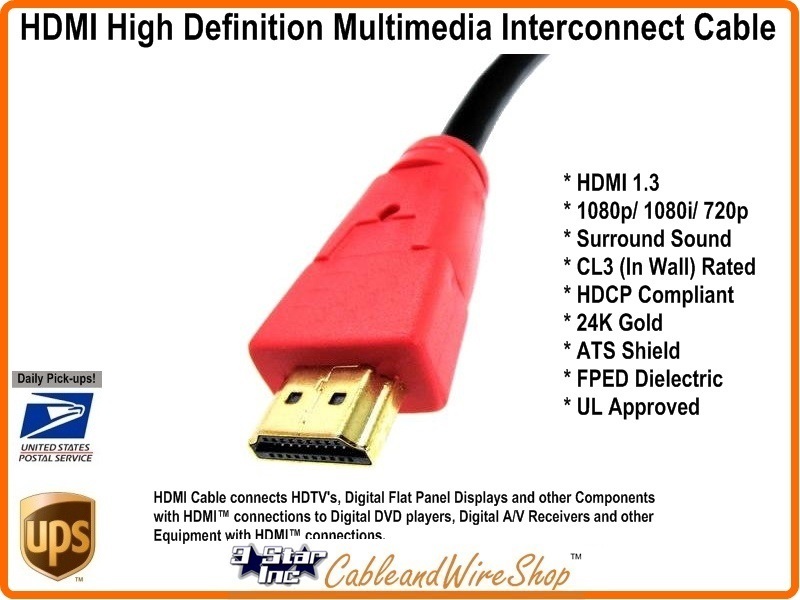 Is 50 Feet (with Self-Contained Line-Powered Repeater Built-in) of HDMI Cable that connects HDTV's, Digital Flat Panel Displays, PS3's, Game Consoles and other Components with HDMI connections to Digital DVD players, Digital A/V Receivers and Wall Plates with HDMI connections. Note: This is NOT the Cheap Thin Wire Stuff you see for Sale everywhere else. This Cable has Heavy Gauge Shielded Wire inside and Heavy Duty In-Wall Rated Sheath outside! These Professional High Speed HDMITM Cables are CL Rated by the National Electric Code for in-wall applications. CL3 rated cables are flame retardant and low smoke and are the right choice for permanent installation behind a wall in new or existing construction applications. High Speed HDMITM Cables are tested to carry HD signal up to 1080p and higher. Use a High Speed Cable also for 720p/1080i signals that are capable of increased refresh rates (above 60Hz) or Deep Color. High Speed HDMITM Cables will also support applications that only require a Standard HDMITM Cable. The HDMI 1.4 specification adds a data channel to the HDMI connection, enabling high-speed, bi-directional communication. Connected devices that include this feature can send and receive data via 100 Mb/sec Ethernet, making them instantly ready for any IP-based application. The HDMI Ethernet Channel allows internet-enabled HDMI devices to share an internet connection via the HDMI link, with no need for a separate Ethernet cable. It also provides the connection platform that will allow HDMI-enabled components to share content between devices. The new specification adds an audio channel that will reduce the number of cables required to deliver audio "upstream" from a TV to an A/V receiver for processing and playback. In cases where a TV features an internal content source, such as a built-in tuner or DVD player, the Audio Return Channel allows the TV to send audio data upstream to the A/V receiver via the HDMI cable, eliminating the need for an extra cable. The 1.4 version of the specification defines common 3D formats and resolutions for HDMI-enabled devices, enabling 3D gaming and other 3D video applications. The specification standardizes the input/output portion of the home 3D system, facilitating 3D resolutions up to dual-stream 1080p. The new specification enables HDMI devices to support extremely high HD resolutions, effectively four times the resolution of a 1080p device. Support for 4K allows the HDMI interface to transmit digital content at the same resolution as the state-of-the-art Digital Cinema systems used in many movie theaters. 4k x 2k represents resolutions of 3840 x 2160 pixels and 4096 x 2160 pixels. HDMI now supports color spaces designed specifically for digital still cameras, enabling more accurate color rendering when viewing digital photos. By supporting sYCC601, Adobe®RGB, and Adobe®YCC601, HDMI display devices are capable of displaying more accurate, life-like colors when connected to a digital camera.